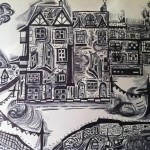 25 June 2014 – Upcoming local artist, Charlotte Jones will be exhibiting her work at Little Sutton Library for six weeks from Thursday, July 3. Charlotte, an art student discovered her interest in buildings, architecture and harbours after spending time in the Channel Islands. A recent holiday to the Caribbean further inspired her to develop her ideas and to experiment with a range of media, varying from mixed media and exploring textural elements, to finely detailed pen drawings. Her work can be viewed at Little Sutton Library until August 15, 2014.